Production on the anticipated 20th Century Fox adaptation of Deadpool just officially began last week as Ryan Reynolds and some of his co-stars revealed some photos from behind the scenes, mostly of the chairs they sit in on set during production. But now we finally get some good stuff as Reynolds has just taken to Twitter to post the first official photo of himself in wardrobe as Deadpool. 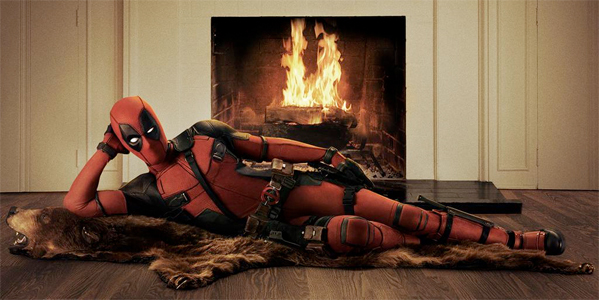 And in perfect Merc with a Mouth fashion, he's posing on a bear rug in front of a fireplace, not unlike one of Jack's French girls from Titanic. At least we know that Deadpool will have his signature sense of humor for this feature film. Look! And here's the Burt Reynolds photo that likely inspired this little gem right here. Deadpool is directed by visual effects veteran Tim Miller, making his feature directing debut, with a script from Zombieland writers Rhett Reese and Paul Wernick. Ryan Reynolds reprises the titular character he originated in X-Men Origins: Wolverine, a disfigured and mentally unstable mercenary known for his or his sarcastic, talkative nature and his tendency to break the fourth wall. The film will alsoinclude T.J. Miller ("Silicon Valley), Morena Baccarin ("Homeland"), Gina Carano (Haywire) and Ed Skein (The Transporter Refueled). Production is now underway and 20th Century Fox releases it next year February 16th, 2016. I'm really glad they decided to give us a look at the costume so early. It looks way better than I expected! Does anybody know if this a 'real' live action movie or a CGI (with motion-capture) like the test footage? It's live action, hence the costume. Wow....so the eyes will be expressive just like the comic?! Is that a practical effect or CGI?!!! And you know this for sure because...? It's a 100% real costume, but the eyes were rendered with CGI to make them more expressive. I know this for sure because logic.... Most likely this image is just photoshopped, but if he's going to be moving those eyes in the film, it has to be CGI. There's no other way to do it as convincingly as the comics, games or cartoons. Well if the costume around the eyes were made to be connected to his orbital bones he might be able to manipulate it, and it would probably look very comic-like. Probably CG though. According to an article I just read in reference to a picture Ryan Reynolds tweeted last month: Some of you may wonder why this version of the Deadpool mask is pink instead of that trademark red. The answer is quite simple: Reynolds isn’t going to be wearing a full and proper superhero suit in this film. Like the test footage that leaked online (and ultimately got the film its green light), Reynolds will provide the physicality and voice of the fast-talking Mutant mercenary Wade Wilson, but the actual costume will be a CGI creation. The pink color will allow the visual effects team to easily remove this temp outfit and replace it with something proper. ....oh....and this: http://screencrush.com/ryan-reynolds-teases-his-deadpool-costume/ From the article "Some of you may wonder why this version of the Deadpool mask is pink instead of that trademark red. The answer is quite simple: Reynolds isn’t going to be wearing a full and proper superhero suit in this film. Like the test footage that leaked online (and ultimately got the film its green light), Reynolds will provide the physicality and voice of the fast-talking Mutant mercenary Wade Wilson, but the actual costume will be a CGI creation. The pink color will allow the visual effects team to easily remove this temp outfit and replace it with something proper." Lets see if great costume = great movie. Looking forward to this project. Wonder if Marvel will actually leave Deadpool for dead until the movie release. I love the fact that they're actually using the white eyes in the costume. I was afraid they'd make the eyes be...regular eyes (I guess that's how you'd say it). Unlike FF4, this movie is gearing great hype being so far away.